Absent pulmonary valve is a rare defect in which the pulmonary valve is either missing or poorly formed. Oxygen-poor blood flows through this valve from the heart to the lungs, where it picks up fresh oxygen. This condition is present at birth (congenital). Absent pulmonary valve occurs when the pulmonary valve does not form or develop properly while the baby is in the mother's womb. When present, it often occurs as part of a heart condition called tetralogy of Fallot. It is found in about 3% to 6% of people who have tetralogy of Fallot. Tetralogy of Fallot is a type of congenital heart defect. Congenital means that it is present at birth. When the pulmonary valve is missing or does not work well, blood does not flow efficiently to the lungs to get enough oxygen. In most cases, there is also a hole between the left and right ventricles of the heart (ventricular septal defect). This defect will also lead to low-oxygen blood being pumped out to the body. The skin will have a blue appearance (cyanosis), because the body's blood contains a low amount of oxygen. Absent pulmonary valve also results in very enlarged (dilated) branch pulmonary arteries (the arteries that carry blood to the lungs to pick up oxygen). They can become so enlarged that they press on the tubes that bring the oxygen into the lungs (bronchi). This causes breathing problems. 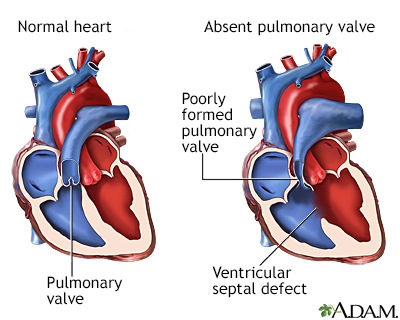 Heart problems that occur with absent pulmonary valve may be due to defects in certain genes. Absent pulmonary valve may be diagnosed before the baby is born with a test that uses sound waves to create an image of the heart (echocardiogram). During an exam, the health care provider may hear a murmur in the infant's chest. Infants who have breathing symptoms typically need surgery right away. Infants without severe symptoms most often have surgery within the first 3 to 6 months of life. Infants with severe breathing symptoms may need to get oxygen or be placed on a breathing machine (ventilator) before and after surgery. Without surgery, most infants who have severe lung complications will die. In many cases, surgery can treat the condition and relieve symptoms. Outcomes are most often very good. Call your provider if your infant has symptoms of absent pulmonary valve. If you have a family history of heart defects, talk to your provider before or during pregnancy. Although there is no way to prevent this condition, families may be evaluated to determine their risk for congenital defects. Bernstein D. Acyanotic congenital heart disease: regurgitant lesions. In: Kliegman RM, Stanton BF, St. Geme JW, Schor NF, eds. Nelson Textbook of Pediatrics. 20th ed. Philadelphia, PA: Elsevier; 2016:chap 428. Bernstein D. Cyanotic congenital heart lesions: lesions associated with decreased pulmonary blood flow. In: Kliegman RM, Stanton BF, St. Geme JW, Schor NF, eds. Nelson Textbook of Pediatrics. 20th ed. Philadelphia, PA: Elsevier; 2016:chap 430. Scholz T, Reinking BE. Congenital heart disease. In: Gleason CA, Juul SE, eds. Avery's Diseases of the Newborn. 10th ed. Philadelphia, PA: Elsevier; 2018:chap 55. Absent pulmonary valve is a rare defect in which the pulmonary valve is either missing or poorly formed. The pulmonary valve allows oxygen-poor blood to travel from the heart to the lungs. When the pulmonary valve is missing, the branch pulmonary arteries are very enlarged and press down on the airways in the lung, causing breathing problems. 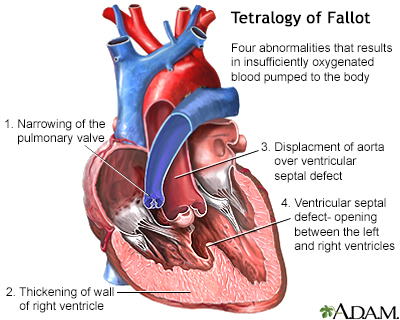 Tetralogy of Fallot is a birth defect of the heart consisting of four abnormalities that results in insufficiently oxygenated blood pumped to the body. 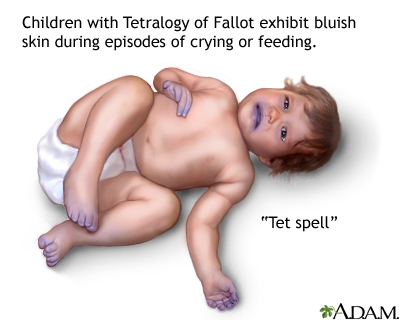 At birth, infants may not show the signs of the cyanosis but later may develop episodes of bluish skin from crying or feeding called "Tet spells".